Summary: Our new woodworker, Houa, arrived and started tearing apart the drawer cabinet by the entryway. He also started on the galley, removing the stove, oven, and the entire sink cupboard. 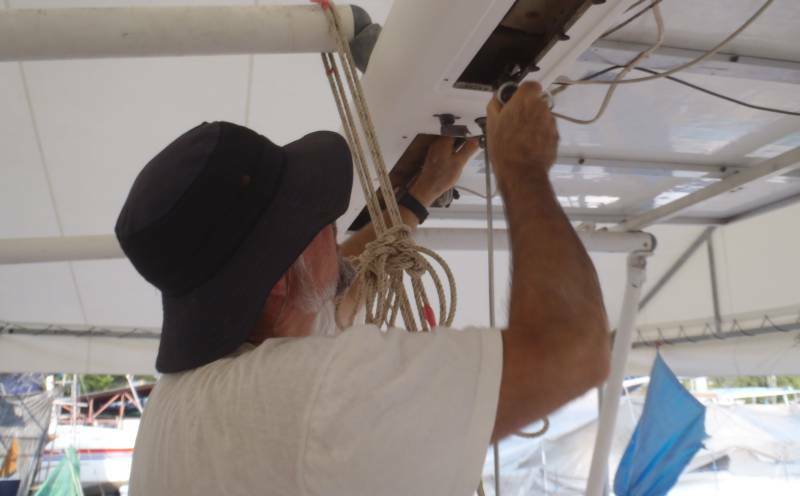 Jon removed several fittings from the top of the targa bar, like the mainsail track. Foam sheets were bought and sections cut and fitted to the depressions where the balsa had been. Golf tried epoxying down a couple of foam sheets, but without using polyethylene sheeting, so we bought him some polyethylene and showed him how to use it. 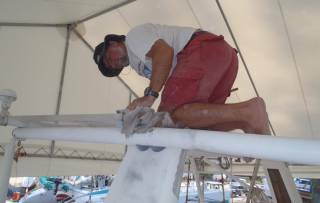 We eventually settled on a hybrid between our 2 methods of putting the decks back, putting fiberglass and foam down in one operation, and then applying the top coats of glass the next day. 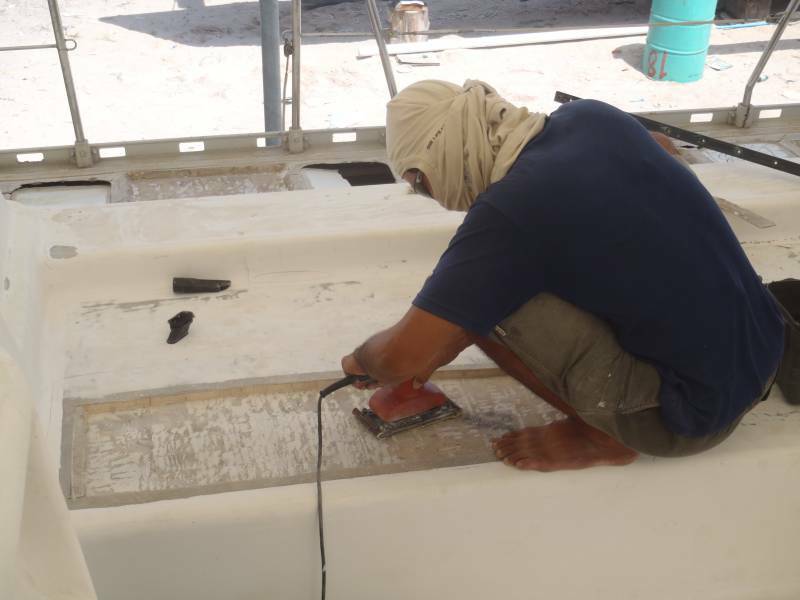 Grinders continue to work on the underwater sections of the hulls, finishing starboard side and starting on port. Gasoline from whiskey bottles. Only gas for miles! 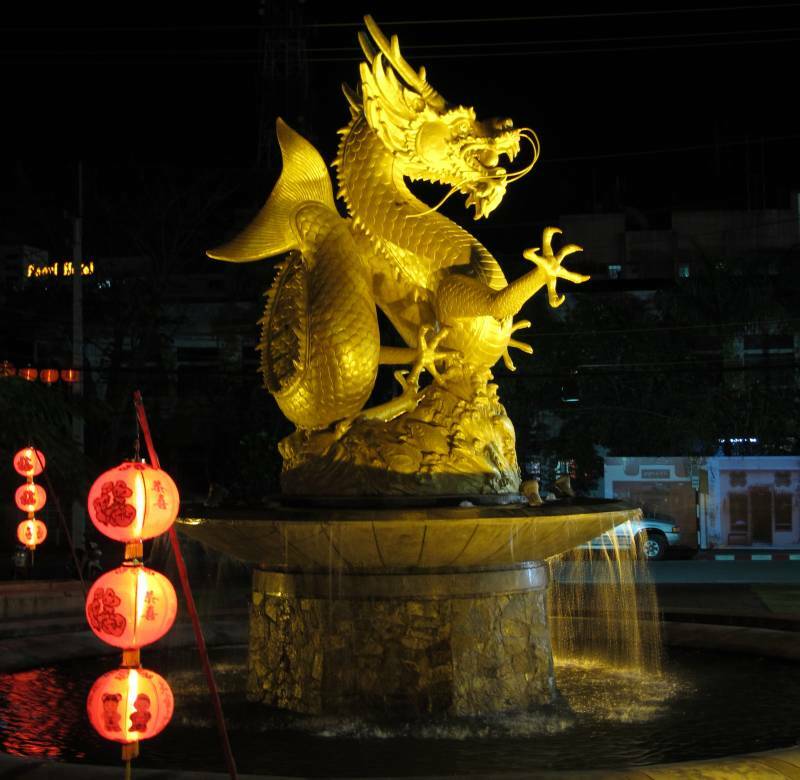 Gong Xhi Faa Chai! Today is Chinese New Year, the year of the Golden Dragon! So, of course, our workers are taking the day off and so did we. We rented a car and drove up the west side of Phuket Island, looking at the beautiful beaches and lush scenery. The island is alive and crawling with tourists, the beaches crowded with umbrellas and string bikinis and chubby pink people, the streets a steady traffic jam in Kata, Surin and Patong. When our energy flagged we pulled over in crazy Patong, begged an illegal parking spot from a tuk‑tuk driver and hopped into our favorite coffee shop, True Coffee, right next to the ubiquitous Starbucks competition. No competition in my mind! True has the best blended coffee drinks on the island! We've done this sort of driving tour several times, of course, but this time we decided to dive into an area we hadn't been to before because it showed on the vague maps as being full of waterways and swamps. Turns out that the swamps are now mostly lakes and lagoons with small villages around them, some touristy and some very local but all quite interesting with the typical Thai mixture of both scruffy and pretty. 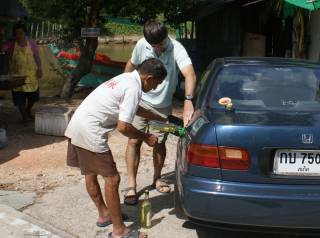 But we got so involved in poking around that we almost ran out of fuel, and ended up buying some from a road‑side vendor who dispensed it out of old scotch bottles (at $2/liter or $7.50/gal). Since we still had our rental car, we took our friends Steven & Toya from the catamaran Cheers up to the airport so they could fly back to South Africa. On the way home we stocked up with soft drinks, so we can put them out for our workers. Microsoft (and most tech companies) give their workers free refreshments, thinking that they'll then produce more and better work. Sounds reasonable to us, and it can be HOT working on Ocelot, especially inside with her all closed up. 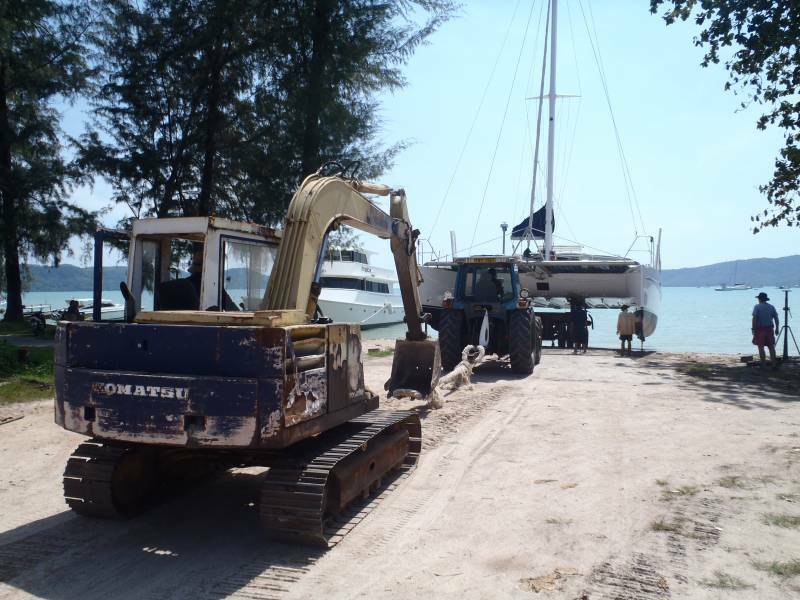 We spent much of the day driving around Phuket Town looking for bits - a 3/8" universal joint for our socket set, so Jon can get at some of the bolts holding down our sail‑track on top of our targa bar, and also a replacement battery lug to replace the one that a worker broke. Amazing how long this sort of thing can take. The good news is that our battery charger has finally kicked in. We hooked it up over a week ago, but the voltage at the yard is so poor (175v when it's supposed to be 230) that our poor charger has refused to attempt charging. We're surprised that the workers tools don't burn up, as most motors don't like low voltages. Apparently the voltage went up last night enough for the charger to start. Now that it's started it should continue to charge, albeit at a very slow rate when the voltage is low. Jon also cleaned the thick dust off the solar panels so they should work a bit better as well, but since they're shaded under our tent they can't keep up with the fridge. Yes, Sue does exist, but she's usually behind the camera. She takes most of the pictures, organizes the afternoon "soda manau" (cool, fresh, lime soda drinks) from the drinks lady (we often buy a round for our workers), and tries to make sure that the little jobs don't slip through the cracks. Today she got hot, sweaty and dusty by grabbing the shop vac and attacking the cockpit bilges to remove the last of the layer of dust that had settled on the batteries, and the bilge floor. Fun! This is one of the 2 high-tide times this month, so several boats have launched and several more have come out to get worked on. Our Aussi neighbors Jim & Sheryl on Odyssey 9 launched, and now we have a new neighbor, a very fast looking cat from France. The owner was impressed at Sue's French and complimented her on it. Our friends Rolf & Daniella across the track on Yelo should be launching tomorrow. The strange part is that the higher tides are at night, so most of the activity is near midnight. Another bit of good news is that we should be getting a carpenter again tomorrow. 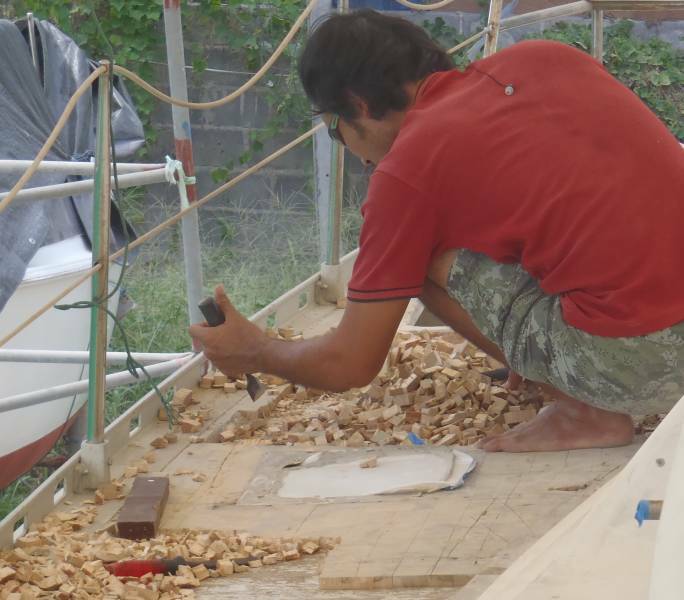 We really liked Meng, as his good humored smile raised everyone's spirits, but he's busy rebuilding a fishing boat and has told Golf that he won't be back in time. Grinding the old paint off the hulls is about 75% finished, but the guys didn't show up today and only 1 of the guys sanding the varnish down below showed up. Both of the guys digging the balsa out of the decks continued their work and they only have a bit at the port bow still to do. Many of Ocelot's floor‑boards went to Golf's workshop to get worked on more there. They only need a bit of touch‑up before the long job of restoring 10 layers(!) of varnish can begin. The new carpenter came today and he listened carefully as first Jon, then Golf (in Thai) explained what we wanted done. He speaks a bit of English but there will still be lots of translating going on. For those of you wondering how Sue's Thai lessons are working out, let's just say it's a very tough language and she is not likely to use it for anything more than social chit chat or ordering things in a shop or restaurant. 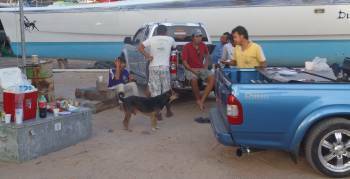 We have been very seriously warned by other yachties that it's a bad idea to try and convey instructions with a boat work crew in Thai. What can happen then is that they do the work however they do it, and if you don't like it they are able to make it very clear that that's what YOU said. Given the difficulty of choosing the correct tone for a word and therefore the correct meaning, we can see how this would happen very easily. So for now it's best to convey instructions in English and be sure that Golf understands what we want. The carpenter attacked the area of rotted wood under and beside the fridge right by the companionway. Jon is already planning how to change the fridge tubing to keep it from getting wet all over again. Out in the cockpit, Jon continued removing the main sheet track from the top of the Targa bar, so that's now off and Golf can carry on with the sanding, prep and painting up there. We'll have to be sure the solar panels are well protected from epoxy, scratches, and paint over-spray when the Targa bar gets worked on. By late morning our meager crew of 3 had increased to 6 workers, and the grinding of fiberglass and anti-fouling began again in earnest. On deck, 3 guys were sanding and prepping the areas to be filled with epoxy and foam, something that might happen tomorrow! Oh my gosh! Can we stand the excitement? An actual step forward, instead of another step backward? Well, seeing is believing. Another cat launching. Someday it will be Ocelot! It was a busy day for the yard: Manoon and Manop, the brothers who own the business were scurrying around in their tractors and big towing rigs, setting up the cradles that move the boats. 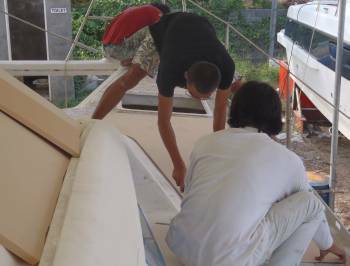 Our Swiss friends on Yelo were launched first -- their white catamaran with bright yellow mast is now gleaming out in the Au Chalong harbor. Another big cat was launched, then a couple smaller powerboats where taken out. These guys are very efficient and coordinated, since the high tides wait for no one! We have new French neighbors with a one-off fast cat. He says he does 12‑15 knots most of the time, and would go up to 25, but his wife is the "brake." Sue is having fun renewing her acquaintance with the French language as she chats to the Quebecois family and the French couple. We ate a small lunch of cold ham and cups of Sprite in the shade by the ocean, then went back to see how Ocelot was doing. 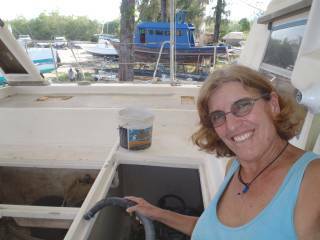 Too much fiberglass dust in the air, both below the boat and on deck with all the grinding, so we called it a day, early. Golf says he will start the cutting and laying of foam on the decks tomorrow. Fingers crossed. Sue's favorite part of the day? Standing in that cool shower back in the tidy (cleaned twice-a-week) apartment. Break out the champagne! Well, a sip anyway. Today we saw the FIRST re‑construction of Ocelot. But hold on, first there came some massive destruction created by the new carpenter, who seems to really love his work. As in, he works hard and smiles a lot! We got to the boatyard this morning to find our drawer cabinet all cleared out and ready to be re‑paneled, and our double galley sinks were pulled out. Golf asked Jon to please remove the 2 faucets (the pressure faucet between the sinks and the foot pump faucet on the side) as they didn't want to break anything. So Jon attacked the galley, and voila! We had an empty sink area. Then he took out the stove top and the oven, a job we had waited to do once we were sure we had a replacement. Boy, does it look barren in there. But our carpenter wasn't finished. When we came back at 2:30 after lunch we found that he had taken out the whole sink cabinet and - Oh my Gosh! What a lot of rotted wood. We knew there was a problem back there due to darkened teak, but we really had no idea of the extensive water damage we'd been accumulating over the years. The carpenter worked to get the cabinet free, and the whole thing has to be scrapped and re-built. Now I understand the high carpentry quote we got from Golf (it was higher than some others). We think he has a pretty good eye for problems. He didn't flinch at the size of the job to fix the galley. In fact, if anything, he encourages his workers to do the best job they can, even if it means more time and more work. We really appreciate that attitude. If we were in a hurry we might feel differently. But as it is, we want a good job, not a fast job, and Golf has told us that he has communicated that to his team. Outside, our team put up a big tarp to try and keep the hull grinding dust contained. On deck the guys were making stencils out of bright orange plastic to cut the foam that will fill the decks where the balsa came out. We're using a standard 80 lb/cubic‑meter (density) closed cell construction foam. It needs to be a good fit, to minimize the epoxy that we'll use to fill any gaps. In the afternoon, the re‑construction began! 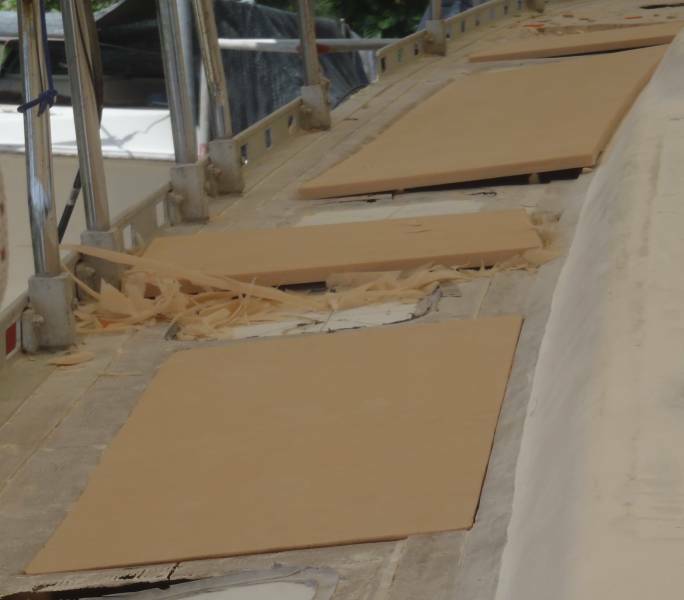 A section of foam was custom fitted, then epoxied, and laid in, then it was glassed over. Golf wanted to put only a single layer of biaxial glass down (he'll put more layers on later), then cover it with peel‑ply (a special cloth that doesn't stick and can be peeled up after the epoxy has hardened). He put weights on top of the peel‑ply, but didn't really put anything down to spread the load. Unfortunately, we all forgot that the aft-most section has a big cleat in it, so once the foam was down they had to pull it out again so that the place for the cleat bolts could be made with epoxy mud. No way do we want to screw down into our new foam! Golf supervised the laying down of a couple more patches, and then Jon asked if maybe they could try it his way tomorrow. Because we don't have a vacuum pump to vacuum the fiberglass and foam, we want to make sure the sections are well adhered, and for that we want to put all 3 layers of glass on top of the foam, then a layer of polyethylene plastic sheeting on top of the final layer of wet fiberglass (nothing sticks to polyethylene, so we can take it off easily afterwards), then a layer of soft foam‑rubber to spread the load, then a board, then lots of weights. The polyethylene and foam‑rubber still have to be found so Golf will take Jon out plastic hunting tomorrow. Despite the difference in techniques, it was still exciting to see some of the deck looking more solid once again! What's left of our galley. The stove goes to the right. Jon commands the polyethylene to release the epoxy! Thank goodness we seem to have a good carpenter on our team! 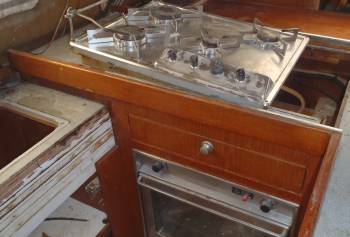 When he wasn't brainstorming with us about the stove he worked on fitting new pieces of marine ply into the drawer area by the companionway. He's removed the entire sink cupboard, and completely cut away all the rotten wood (much more than we anticipated) revealing our firm and dry fridge insulation on 2 sides. 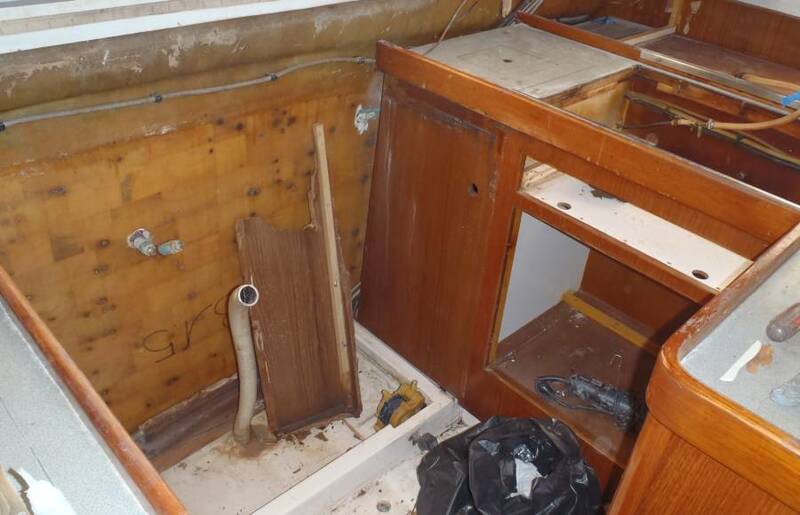 With so much to rebuild, this gives us a chance to re‑think how the galley should be laid out, but I don't think we'll make any radical changes. On deck, the situation was not much better. 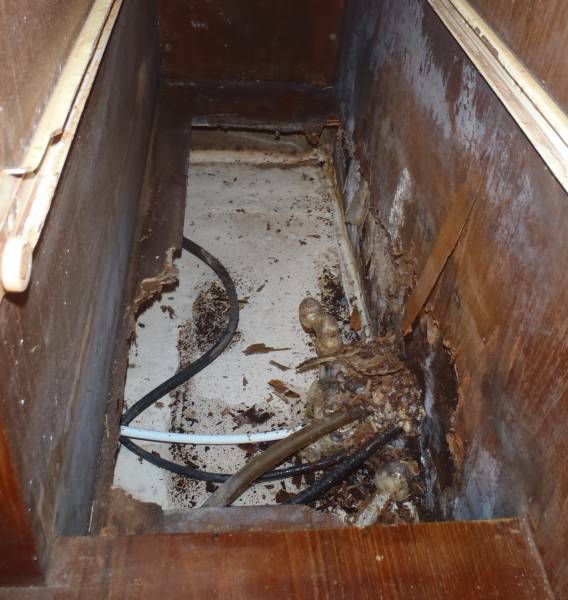 When they tried to peel the peel‑ply off last nights fiberglass, they found it wouldn't peel! Indeed, some of the wood we used to hold everything down was stuck down as well. So the guys were patiently chipping the wood away with chisels, and trying to peel the peel‑ply off when they could. In the end they resorted to sanding it off, a long and tedious job. So the next attempt we want to do our way. We went into town with Golf to get some polyethylene sheeting and a 1" (2.5 cm) sheet of cheap foam‑rubber. Polyethylene (think plastic milk jugs) has the unique characteristic that nothing sticks to it, even epoxy. So Jon wants to stick the foam in with epoxy, as Golf did, but then put all 3 layers of biaxial fiberglass on top, then cover everything with a sheet of polyethylene. Ideally, we'd vacuum everything down at this point, but we don't have a vacuum pump, so instead we'll put a sheet of foam‑rubber on top of the polyethylene, then a board on top of that, and finally load on as many weights as we can to push everything together. That should give us the strongest possible structural repair, leaving only the cosmetics to worry about (which Golf is very good at). Since nobody in town knows what Jon means by polyethylene (and there's LOTS of other plastic sheeting around, especially vinyl, which does stick to epoxy) we bought 2 different types of what we think is polyethylene sheeting (one of them actually a car cover!) Then we laid up 2 small pieces of fiberglass on them, as test pieces. Tomorrow we'll pull them apart to see if they're really polyethylene. If so, we'll start glassing more bits of foam into the decks. The starboard hull is now clear of all anti-fouling, and there only remains about 3/4 of the outer side of port hull to do. It will sure be nice when all that grinding is finished! Most of the work today involved chipping out the last of the balsa from the deck, trimming the foam to fit into where the balsa was, and grinding the bottom‑paint off the outside of the port hull. Apparently thick teak‑faced plywood isn't available, so Houa (our carpenter, pronounced Ho) epoxied thin sheets of teak‑faced plywood to thicker sheets of marine plywood, to make the sheets that he'll use in rebuilding our galley. While we'll put in additional drain holes and try to make sure that water doesn't get where we don't want it, we'll also epoxy coat the wood we put in, so it should be much more water resistant in the future. We checked our epoxy samples today, after they'd cured overnight. Both released, but the one with the woven texture didn't release as well. Apparently the epoxy grabbed onto the textured surface, so the polyethylene tore as it was removed. The other sample, made with the car‑cover, came off beautifully, so at least we've now found good polyethylene to use. Jon and Golf also discussed the overall plan for the deck. Golf is more used to heavy construction, where you just slather on more layers of fiberglass. Jon's trying to teach him more sophisticated epoxy work, where improving technique will save him expensive epoxy, and will give Ocelot the strongest (and lightest) decks we can. The workers Golf employs seem to be a mixed bag. 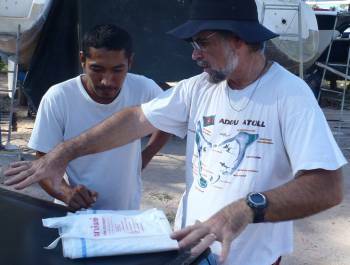 Some of them are very good, and some have surprising deficiencies, like they've never worked on boats before. Golf asked one to feather the edges of an area we wanted to epoxy and what he did was to grind off almost all of the old fiberglass, not feather it down gradually. Unfortunately, Golf wasn't around so all of that work will have to be redone on Monday, delaying our deck rebuilding. The technique we want to show Golf is more complicated than what he's used to, but should produce a lighter and stronger repair. We'll try it first on some easy to access (and not as structurally important) sections before we tackle the decks. Today being the end of the work week, we threw our workers a small after‑work party with beer, sodas, and chips. Golf added some barbequed chicken and unleashed his massive car sound system, so everyone could relax. The Canadian boat across from us also threw their workers a party, so everyone had fun.